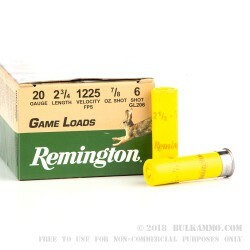 Available in a variety of gauges and with every shot from BB down to #9, Remington’s Game Loads line of shotgun ammunition gives hunters the upper hand when they head upland. 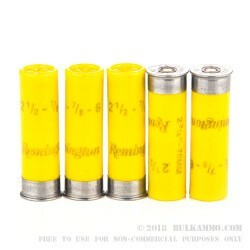 This 20 Gauge shotshell is loaded with ⅞ ounces of #6 lead shot, a versatile shot in the middle of the range of sizes that birdshot is available in. 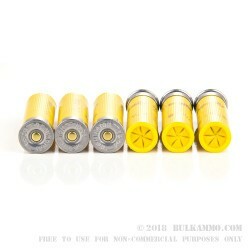 These .11” pellets’ approximate 12” kill zone at around 100 feet is certain to take down pheasant, grouse, dove, and pigeon with ease, and can even drop a lively tom at closer ranges. This shell is also optimal for hunting rabbit (provided you are vewy, vewy quiet), as it can penetrate their hides without mangling their meat. This shell’s sturdy hull with its six segment crimp, clean burning propellant, and responsive primer work in conjunction with its spherical shot to deliver a remarkably uniform experience with every trigger pull. 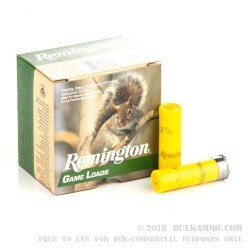 It’s just another perfect example of why Remington stays at the top of their game.